We love to hear your feedback! If you would like to review our services, please do so on any of the following sites: Facebook, Yelp, Google or AVVO. If you have any questions or need help, just give us a call. Say “Amen” to Your Legal Hassles if you Retain this Law Firm. Our experience with Amen, Gantner & Capriano was an exceptional experience. The client is made to feel welcome and all the feelings of stress and anxiety are quickly dissolved after one visit. The way the whole firm is run is the way all law offices should be run. My legal concerns were handled by a whole team of professionals in a very short time frame. There are no surprise fees. All this is discussed upfront. However many visits it takes to bring your issue to a successful conclusion, this law firm is available from beginning to end. They are assertive in a way to help you get the best results. They have a sense of humor at all the right times. Committed To Helping Each Client Know Their Estate Does Matter. This Law Firm is ideal for us. They are a small group of very knowledgeable Lawyers and we feel like “family” each time we need their help. They always offer us a drink such as soda or bottled water. Their receptionist room is comfortable, we are always served at our assigned appointment time. Finally, everything is explained to us in terms that we can easily understand. Very professional. On time and explains everything. Great firm to help older family members understand Estate Planning and preparing for the future. Very affordable and Knowledgeable. Mr. Gantner, Pat, everyone treated us with courtesy, respect and ease. 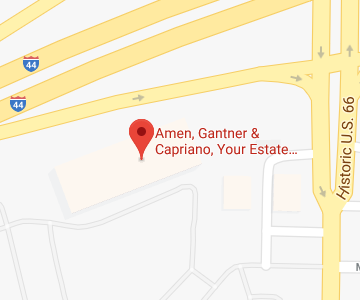 Our experience was that Amen, Gantner & Capriano operates effectively, efficiently and with just the right level of informality to make us feel well served and at ease even with sensitive Information and difficult decisions. We felt that the services were provided reasonably and were a good value for the money. Charles Amen is an attorney who combines professionalism and expertise with genuine interest in and empathy with his client. After finally making a long-overdue appointment to create a will and an estate plan and feeling embarrassed about my delay, I found Mr. Amen to be knowledgeable, personable, and reassuring in regard to my many questions and concerns. His approach was straightforward and positive. I felt confident that my legal matters were in capable hands. Mr. Amen addressed appropriate actions related to my past decisions, present issues, and possible future needs and took plenty of time to explain details of my estate plan including actions I should take to complete the process. I appreciated the fact that he is an excellent, understanding listener! I also commend the staff for making appointments and fielding questions in a personable, patient, and friendly manner! Thank You! Capable and Caring, No Better Combination. From the moment of my first interview with Jackie Capriano, I felt a sense of relief that is indescribable. After my mother had a stroke and was not going to be able to stay alone, I had not had a good nights sleep. After I brought my case to Jackie who put me in the very capable hands Margaret Givens and Gail Lee, I have very little trouble sleeping. If there is a problem, they handle it. That is it in a nutshell! Very Knowledgeable and Professional. Committed to Helping. Paul Gantner is an amazing professional. He has been committed to being helpful and supportive with my estate and living trust planning. I know these matters are important and would recommend Paul and the firm for anyone looking for estate planning needs. Paul is especially thoughtful and knowledgeable in his approach to all issues of estate planning, especially for LGBT clients. I have been very satisfied with this process and professionalism. They will continue to be my go to attorneys for any estate matters in the future. I walked into the office, clueless as to how to handle a situation with my mother, and they sat me down and explained exactly how things would go, took the time with me to make sure I understood, and then after much help with the actual process then expedited it to help me even more. I’m still involved in the handling of the situation, but they have made it go as smoothly as it possibly could and everyone has been a great help..it’s much appreciated!